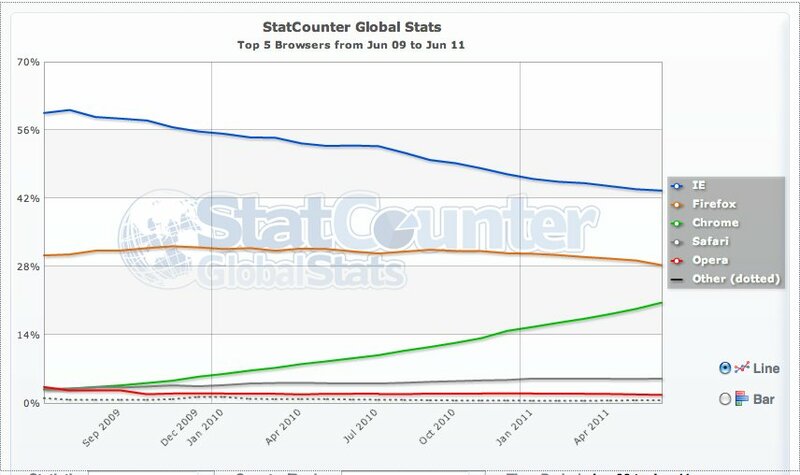 Google’s Chrome (s goog) browser is continuing to grow in popularity. According to StatCounter, a website analytics company, Chrome is now used by a fifth of Internet users worldwide, taking 20.7 percent of the global browser market in June, up from just 2.8 percent in June 2009. In the same two-year period, Microsoft’s Internet Explorer (s msft) share has fallen from 59 to 44 percent, and Mozilla’s Firefox also dropped slightly, from 30 to 28 percent. Note: Browser market share statistics should always be viewed with a healthy slice of skepticism, as they can be skewed depending on where the data is collected from. StatCounter Global Stats are based on aggregate data collected on a sample exceeding 15 billion page views per month (4 billion from the U.S.) from the StatCounter network of more than three million websites, but it should be pointed out that Net Applications, for example, reports Chrome’s marketshare at 12.5 percent in May. It seems no one really know what the market share of any browser is these days because every site you go to has a different opinion on the matter. This isn’t religion, use whatever you want but don’t have it forced on you. I noticed when installing a couple of programs that they wanted to install Chrome so I can see why the numbers/users are rising fast. I use all 3 because there’s always that one site that doesn’t work in one or two very well. Does this data take into account the number of iPads and iPhones that use Safari? I agree though, Chrome is a cracking browser, without fail. It won’t be that long before Mozilla is playing catch-up. I guess the growth of Chrome may slow down, given that Firefox has improved a lot in the recent two versions. I can almost guarantee you that is not the case! Running a business using the browser most of the day, chrome has been an blessing for us. Initially we used IE next to it for certain tasks, but every task we were able to switch to chrome saved time and reduced frustration, to such an extent that we no longer consider applications not working with Chrome. As more people become familiar with the – very fast increasing – capabilities of Chrome, it will only be adopted faster. chrome can only get better though. IE needs to innovate or die. I don’t think it’s just speed and web standards… Safari had that before Chrome and never got much traction. The big downside is the RAM usage. Separate processes for each tab (and extensions) sum up somewhat. I always found Safari to be a bit clunky on Windows, and Apple never really pushed it on that platform, either, which is probably why it never really got much traction. But you’re right, Chrome’s success is down to more than just speed: it has a nice simple interface and is well designed. I love chrome. I switched to it from firefox the day it launched and I have always used it since then on my pc + mac + linux. Do the Chrome numbers include RockMelt? I would imagine so, but I guess it depends on what UA string RockMelt uses. However, I don’t think RockMelt’s numbers are very significant in comparison to Chrome’s. Chrome is just a better browser … in the end, it’s faster. At this rate Chrome will overtake IE in 2013. Chrome will overtake Firefox in the next year. Not sure about that, Jeff! With both IE and FF pushing out new releases it will be much harder for Chrome to continue to make inroads. New releases doesn’t necessarily guarantee market share. In the case of IE, v9 isnt compatible with Windows XP which a ton of people still use, never mind the fact that their reputation is finally catching up to them and using IE is the modern day equivelent of still using AOL.